This post is dedicated to two good friends of mine. One is close by and and one is across the world from me. One of my closest friends, Travis, works for Molson and has supplied beer for more occasions than I can count. My favourite is the simple refreshing "Canadian" lager. This was the perfect beer for battering because it is light enough that the food doesn't weigh you down but still provides the flavour you are looking for. My other friend, Ben, met Jess and I on our adventures through New Zealand and Australia. His hobby of metal working produced the amazing bottle opener shown above. "Canadian's" are convenient twist offs but I couldn't help but team the beer and the opener up to make beer battered onion rings for a BBQ. At the BBQ I went crazy deep frying anything I could get my hands on. I started with some french fries followed by the onion ring then followed them up with fried jalapeno's and banana peppers. The rings and peppers disappeared pretty quickly right out of the frier, but we did have enough to snap some pictures and some of them even made their way on to the burgers. In a large bowl, whisk together 3 cups of flour with the spices. Separate one cup. Whisk in the beer until the mixture is well combined. Let the batter rest at room temperature for 10 minutes. Slice the onions into 1/2-inch-thick rings and toss them with the remaining dry cup of flour. Add the oil to a large, heavy-bottomed pot (or fryer) heat until a thermometer reaches 375°F. Working in batches, dip the onion rings into the prepared batter then immediately drop them into the hot oil. Cook the onions in the oil, for about 3 minutes. Immediately season them with salt. This is a really quick and easy salad to throw together. It is a summer salad from the island of Capri in Italy. We have visited Capri but don't remember the salads being any better there than anywhere else. The island is mostly known for their Grotta Azzurra - "Blue Grotto" (see below). Jess and I traveled through Italy for 3 weeks about 4 years ago and it is where I really started getting into food, (not surprisingly it is when I started getting fat as well), and we learned that one of the best things you can do when traveling is to travel with luggage light enough to carry - I should be in an ad for MEC with both Jess and my bags on while waiting for a ferry back to the mainland. It was a simple way to showcase my home made mozzarella and is a great cold salad to have on a hot night. My favourite part of it is the burst of freshness from the basil and tomato and the mix of vinegar and oil. You can eat it with a fork and knife or put the whole stack on a cracker or crostini . If you are ambitious, you can thicken the balsamic vinegar by simmering it with some honey. Slice the tomatoes, season with salt and pepper. Top with a full basil leaf and slice of mozzarella. Drizzle with the balsamic and olive oil. Jess and I were on Vancouver Island visiting my family and we took a day trip to Salt Spring Island. We were planning on going to a market but when we got there we found out that they weren't going to run the market for another week (typical island time starting something three weeks after it's planned). We decided to just go to the places that were supposed to be at the market. One of our favourites was the Salt Spring Island Cheese company. They are mostly known for a fresh goats cheese that they pair with different things to flavour it. After touring the facility and abusing the samples I decided that it would be a good challenge to make it on my own. I found it to be very easy to make a cheese that was just as good as Salt Spring and about a third of the cost. 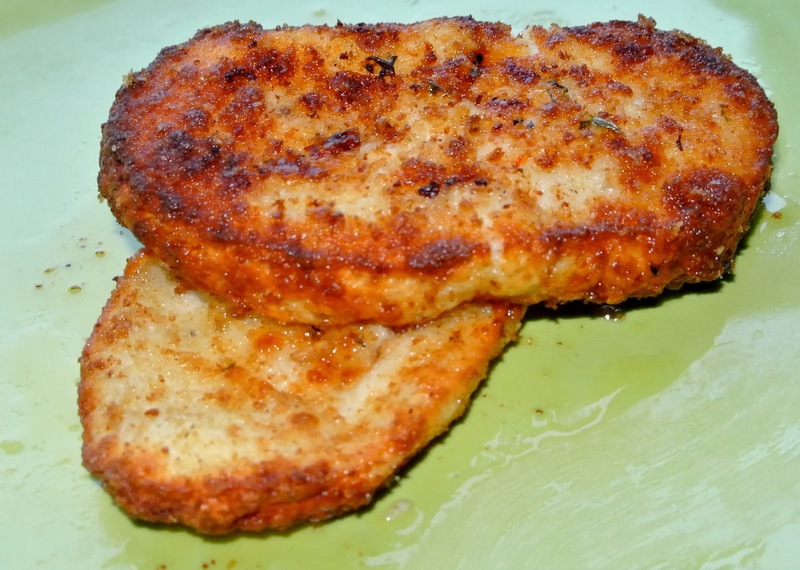 * Plan to make this recipe 2 days before you plan on eating it. It is not time consuming on your part, it just requires a lot of setting and draining time. Heat the milk to 75 degrees F.
Sprinkle the mesophilic culture on the milk and let it dissolve for a couple minutes. Stir the milk with up and down motions of your spoon. Add the rennet mixture and gently stir. Cover the pot and set aside for 16 hours at room temperature. After culturing it will look like yogurt sitting in whey (the clear liquid). Line a colander with a couple layers of cheese cloth. Pour in the cheese then tie the corners up and hang it from a cupboard handle to drain. Drain for 6 to 8 hours. Remove from the cheese cloth and add some sea salt. If your going to add herbs line a short glass with olive oil add the herbs then the cheese. 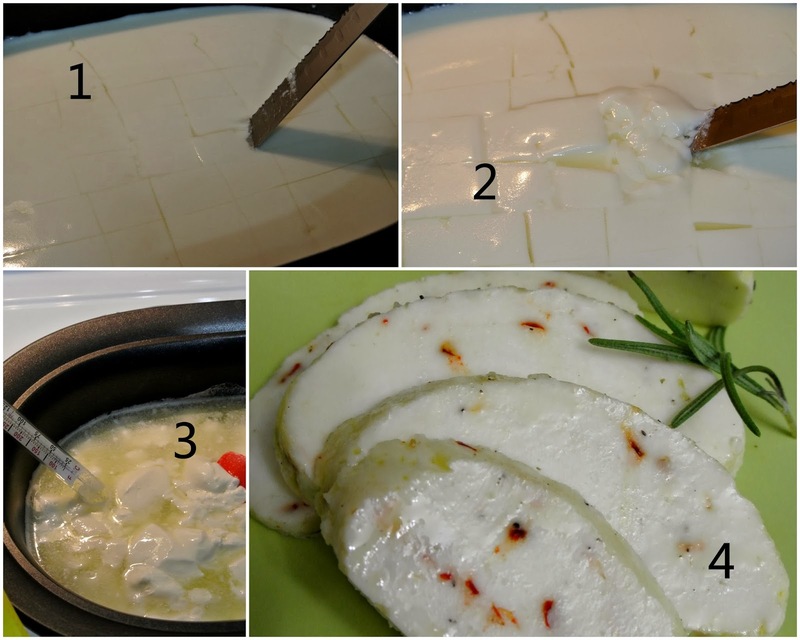 This is an easy recipe that produces amazing creamy cheese that you can kick up to another level with herbs or sauces that you probably have in the refrigerator. I finally caved and bought some cheese making citric acid and some liquid vegetable rennet and remade my mozzarella cheese. It turned out way better than the original. It stretched like I imagined it would and had the perfect creamy texture. I used 1/4 tsp of the liquid rennet. I have been wanting to make fresh mozzarella for the last year or so and I finally got around to it last Sunday. It turns out that it is really cheap, easy and delicious. I made about half a pound of cheese that I divided in two flavoured balls; half with hot pepper flakes and the other half with rosemary. We used it in a salad and I dragged a couple pieces through bread crumbs and lightly pan fried it for the best mozzarella sticks ever. It took less than an hour and I think I am going to make it a regular thing. I am hoping to work my way up to make cottage cheese or ricotta cheese to use as perogy filling. Here are photos of some of the process (full directions below).